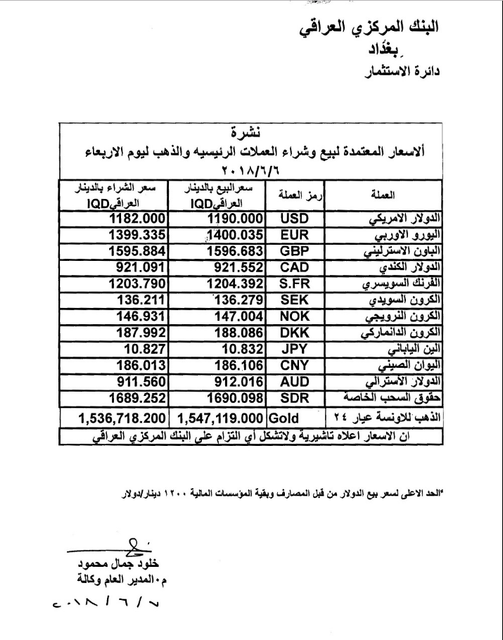 Central bank of Iraq taken off sanctions list today by UN woohoo!!! But I can't post links so go to UN site and read it! On 7 June 2018, the Security Council Committee established pursuant to resolution 1518 (2003) approved the withdrawal of the following entity from the list of persons and entities subject to the asset freeze provided for in paragraphs 19 and 23 of SecurityCouncil Resolution 1483 (2003) , adopted under Chapter VII of the Charter of the United Nations. The names of persons and entities removed from the Sanctions List by decision of the Committee are published in the "Press Releases" section of the Committee's website at:https://www.un.org/sc / suborg / en / sanctions / 1518 / press-releases . To access the updated version of the List of Persons and Entities Subject to Sanctions, Member States are invited to regularly visit the Committee's website at:https://www.un.org/sc/suborg / en / penalties / 1518 / materials . The Sanctions List is available in HTML, PDF and XML formats. THIS IS ............ AS THE CHIEF CORNER STONE IS TO ...............THE PYRAMIDS. I have to say This is a Wow to the nth degree. Delta, wasn't this the main restriction that was keeping them from being even able to go international? That has to be quite a relief! FAMILY THIS IS EXACTLY WHAT FRANK SAID ON THE CC MONDAY !!!!!!!!!!!!!!!!! ( Thanks to JEK for giving this to us ) PLEASE CLICK THE LINK !!!!!! THE PARITY AGAINST THE USD IS STILL HOLDING! IT WAS AN RI STEP!!! IT IS AN RI STEP! WS IS FRUSTRATED… WE ARE DONE WITH THIS.. IT IS THE USAGE OF ART 8 TO HOLD AND MAINTAIN THE 2% COMPLIANCE IN THEIR VARIANCE THAT IS THE GOAL!!!! THE 2% IS ACCOMPLISHED BECAUSE OF THE TOOLS OF ART 8! The progressive steps of the MR is rapidly transitioninginto the new reality. Iraq is in a state of transition...a metamorphosis is taking place from within. Samir Nusairi said, "We have to develop the stability of the exchange rate. Stop using the auctions, stop using the MCP's, return to real banking. Iraqi banks reached out to the international banks...we want to implement this immediately." Would he have said that had we not a suitable environment? Frank, "They are restricting the USD from the ATM's. The NBI is setting the example for other banks to follow suit. The reinstatement steps are the new lava flow." These are all indicators of Article VIII compliance. ROFL...so the great Frank apparently didn't know the sanctions had to come off by the UNSC. Uh, Frank, wasn't it YOU who said all people were waiting for was the final article. Nothing else? Uh, apparently that was not correct. Perhaps you had better go back to studying yourself and stop being so high and mighty like some Yoda like creature you fancy yourself to be. Don't worry kids, it's soon. Just don't ask Saint Frank to define that word, nor any other con artist (guru).